Francesco Prantera, Vatican art restorer, on the sculpture, Laocoön and his Sons. “Timeo Danaos et dona ferentes.” [“Beware the Greeks, even when bearing gifts.”] These five words of Virgil that relate to the death of the Trojan priest, Laocoön and his children. Have been carried through the ages and are still used metaphorically to say: “beware of the enemy who, inexplicably, offers you a gift.” The Greek army had left a gigantic wooden horse in the desert plain in front of the city of Troy with Greek soldiers hidden in its belly. After ten years of war, it was just too tempting for everyone to believe it could be over. Everyone except Cassandra, doomed to clairvoyance and ignored as she implored the citizens to stay away from the mysterious gift. Laocoön intervened with those five famous words to convince the Trojans that nothing good could come from the enemy. He picked up a javelin and hurled it violently against the belly of the horse from which came a hollow sound. Finally the Trojans started to doubt the gift. But then the goddess Athena, siding with the Greeks, sent two giant sea snakes to strangle Laocoön and his sons. The Trojans were confused by this but trusting in the will of the gods, took the horse through the city gates. The epilogue of the story is the destruction of Troy and the escape of Aeneas, the Trojan hero, who fled the burning city for the banks of the Tiber in Italy and founded Rome. The dramas of the Iliad, the Odyssey and the Aeneid all centre on those five famous words. GB Why did you choose this work and not a work of Michelangelo, for example? FP It’s true that am a restorer of paintings, work on canvas, painted boards, particularly on frescoes and murals and the Laocoön Group is a marble sculpture. In the first century A.D. a powerful Roman, (perhaps the Emperor Titus), commissioned three Greek sculptors from Rhodes, Aghesandro, Atanadoro and Polidoro, to create a sculpture of Laocoön. The powerful Romans still admired Greek artists as the best. The work these three created was so astonishing that, Pliny the Elder described its beauty in his “Historia Naturalis” which is still studied today. Pliny died in the eruption of Vesuvius that destroyed Pompeii when his curiosity about nature led him too close to the volcano. For Pliny, nature was the ultimate beauty. The whole body of Laocoön is tense with resistance to death, the muscles, tendons and arteries swollen in effort. His face is turned toward the sky, frozen in the moment of understanding the futility of resistance to his inexorable fate. The younger son, who expects his father to save him, seems somehow lost to the observer – the figure of the father is so much bigger. It is at this fundamental moment that the artists chose to represent the story, at the end of a race and of an era, the synthesis of a whole period of history in a single moment. Even the veins pulsate with life – every square inch expresses vitality, health and strength, so much so that, the work seems to be alive. It remains unexplained how it was possible that the artists had such a profound knowledge of human anatomy, as inexplicable as the idea of the beauty and perfection of a male human body remaining so constant over time. And then the sculpture was lost to the world until 1506, the height of the Italian Renaissance when the courts were full of extraordinary artists, when Leonardo da Vinci, Raphael, and Michelangelo Buonarroti strolled through the streets of Rome and Florence. Michelangelo and Raphael were summoned to Rome by Pope Julius II. Raphael was a young and exuberant painter of 23, Michelangelo a surly sculptor of 33. They were given the task of painting the Pontiff’s rooms. On 14 January 1506, at Opium Hill, near to the residence of Tito in ancient Rome, during the excavations at the ‘Domus Aurea’, the sculptural group of the Laocoön was found. It was slowly removed from the earth and emerged in all its beauty. Experts, sculptors and artists were called to the scene to study it, among them Michelangelo. The statue was quickly identified as the Laocoön that Pliny had described. Michelangelo was so deeply touched by its beauty that we might even say that if we fully grasp the beauty of Laocoön, we understand the art of Michelangelo more deeply. The art of Michelangelo simultaneously expresses the greatness and the frailty of man. Look at the characters in the vault of the Sistine Chapel: the bodies contorted, quadriceps and biceps so powerful that they express the greatness of the human being, yet at the same time we see fragility expressed through the watchful, worried, scared expressions on their faces. Michelangelo paid homage to the statue when he painted the last portion of the fresco on the ceiling, God separating light from darkness. Look at the chest of God: it is the chest of the Laocoön. GB The statue depicts intense suffering. For you, does this make it more or less beautiful? FP The expression of intense suffering can make art beautiful, profound and poignant, because it is through suffering that the man is brought closer to the mystery of life and death. The sculptural group was transported from the excavation site to the palaces of the Vatican and placed in the Octagonal Courtyard where today six million visitors each year stop to admire it. This was the start of the Vatican collection that fills the museums today. In the last years of his life when Michelangelo became blind it is said that he would go the courtyard to touch the statue in order to still perceive its beauty. Raphael was in turn deeply affected and since then, generations of painters, sculptors and artists of every genre and era have been transported by that beauty. GB Do you think it can be considered an example of universal beauty? Does the consensus of people over thousands of years makes it objectively one of the finest works ever created? FP Yes. Ever since the Laocoön was created, its beauty has struck any observer like an arrow, even the multitude of tourists who wait in endless queues to see it. GB It has been restored several times. You have never worked on it? FP I have not had this good fortune, but I know those who have worked on it and are responsible for its protection and maintenance. I have been able to observe it in special circumstances: when the museum is empty and at night by torchlight. The Laocoön Group was found intact, but not completely. The work was missing the hand of one child, the arm of the other, as well as most one of Laocoon’s arms. There was an attempt to complete the work. In 1532 the artist Angelo Montorsoli, a colleague of Michelangelo, was commissioned to reproduce and add the arm and probably on the advice of Michelangelo himself imagined it as reaching upwards. But in 1905 in Rome a merchant named Ludwig Pollack went into the shop of a Roman craftsman and recognised, in an arm tangled with a snake, the arm of Laocoön. So the arm was once again mounted onto the statue, and it is bent at the neck with bulging biceps as Laocoön tries to free himself from the grip of the serpent. In 2009 I was sent on a mission to Berlin for work and I went to visit the altar brought to Berlin from the Pergamon in 1886. The work dates back to 156 BC and was dedicated to Zeus two hundred years before the Laocoon was carved. The theme of the altar portrays the struggle of giants. Strolling along the perimeter of the altar I was struck to see a sculpted bust identical to the Laocoön. So the Laocoön itself is a replica, not only of that portion of the Pergamon altar but probably other prototypes and, as many argue, perhaps taken from a bronze original. GB In your work you are constantly surrounded by works that are considered among the most beautiful and important that we know. Do you ever take that for granted? FP Three years ago something very beautiful happened one night: I was with a colleague working in the Sistine on routine upkeep of the paintings, when we were asked to stop work and wait for about an hour, because there would be a concert. We sat on one side as guests and musicians arrived. The music was from the sixteenth century, the era of Michelangelo. It’s hard to describe the incredible beauty of that experience. FP I believe there is a universal consciousness that recognises beauty in an object, beyond our personal tastes. However, it is the beauty of nature that we all recognise, in front of a sunset, or the sea’s horizon, in a storm, a flowery meadow or a snowy mountain. 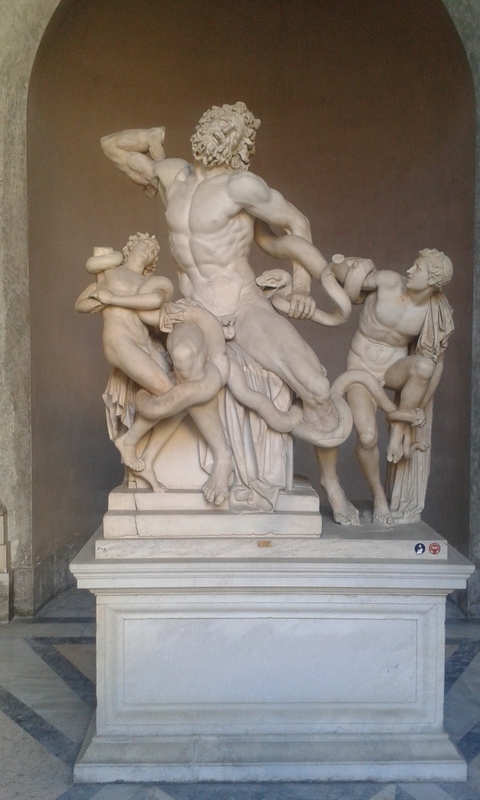 I chose the Laocoön because its creator have attempted to create human perfection and beauty.